In the last blog, we talked about taking the consumer through a purchase journey rather than just asking them to buy immediately. This week, we talk about different ways we can "talk" to our prospective leads. Stop expecting your tiny ads and posts to do all the heavy lifting. Look at the difference between these two ads. What is the big difference between them? Which one would you click on? Most of us would choose the second one wouldn't we? The first one is asking you to buy right now before you've had a chance to even look at the product. The second one is giving something away in order to build trust assuming at some point they will introduce themselves. Both are selling but one feels more like the door-to-door salesperson than the other. A lot of conversion marketing falls into the common sense column. When in doubt, trust your gut. "Would I click on this?" is the best 10-second test you can do. Be brutally honest with yourself. Whatever you do, don't send people to your website. Your website has no idea who you are. How can it? It is essentially that first awkward conversation we all dread where you try to ask as many questions as possible to find out anything that you might have in common. Your poor website essentially has to throw everything but the kitchen sink at uses in the hopes that something will resonate. 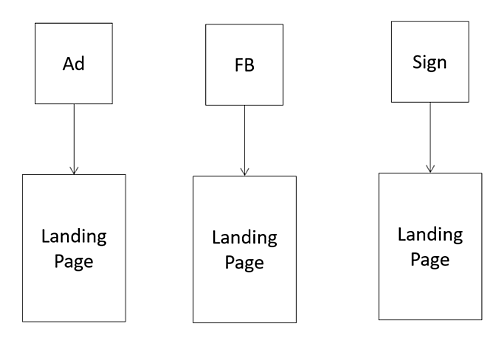 Landing pages exist for one purpose only. To convert. They exist as one-offs and are usually made for each ad depending on how different the messages are. Because of this, you know exactly what the first touch point was for the user and you can get much more personalized and relevant with your content than you can with a website. Stop selling and start talking. So then what? What happens when people hit your landing page? The ad or post drives to the landing page. The landing page asks for a conversation. Essentially, we need to get people into a system where we can talk, learn and begin to gain trust and all that good stuff. The ad and the landing page are just a vehicle to us there. So other than face to face, what are the ways we can have a conversation? Phone. Phone conversations are ideal. It's still a very human conversations (albeit disembodied). Still a good way to get tone and emotion across in a very natural way. Chat is great. A fantastic way cut to the heart of the matter. People have questions and we don't always know what they are going to be. These can be a double-edged sword however as a vacant chat can be equally damaging. Also this is difficult to scale as it requires someone on the other end. ChatBots are a good way to scale but you run the risk of, well, looking like a bot. Still, this is absolutely a way to have a conversation online. SMS/RCS. RCS vs SMS. Rich Communications Services (RCS) is the prototocol that will replace SMS. The protocol got off to a very slow start but now is in the process hopefully of being adopted by the new phones which will allow us to text rich media, do transactions, send tickets, etc. Text is another great way to have conversations albeit somewhat obtrusive. Email remains and is currently one of the most effective ways to nurture leads. 99% of consumers use email at least once a day. Everyone has an active email account. 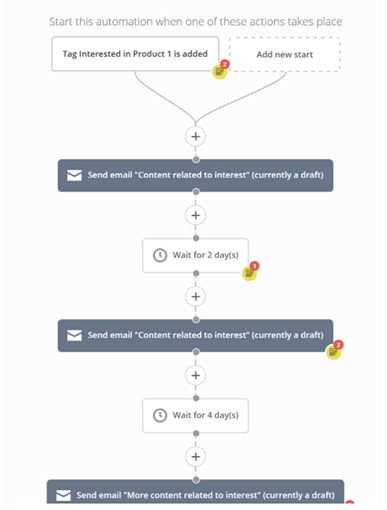 Email automation is essentially a way to chain a sequence of emails together that send automatically based on whatever criteria you determine. It allows us to gradually learn what people are opening or not opening and change the responses to become more and more targeted and relevant. In the example below you can see a very simple version of ads, landing pages and emails working together. Ads/posts are doing whatever they need to do to get a clickthrough, bringing the user to a landing page where it asks for a dialogue in exchange for an offer. 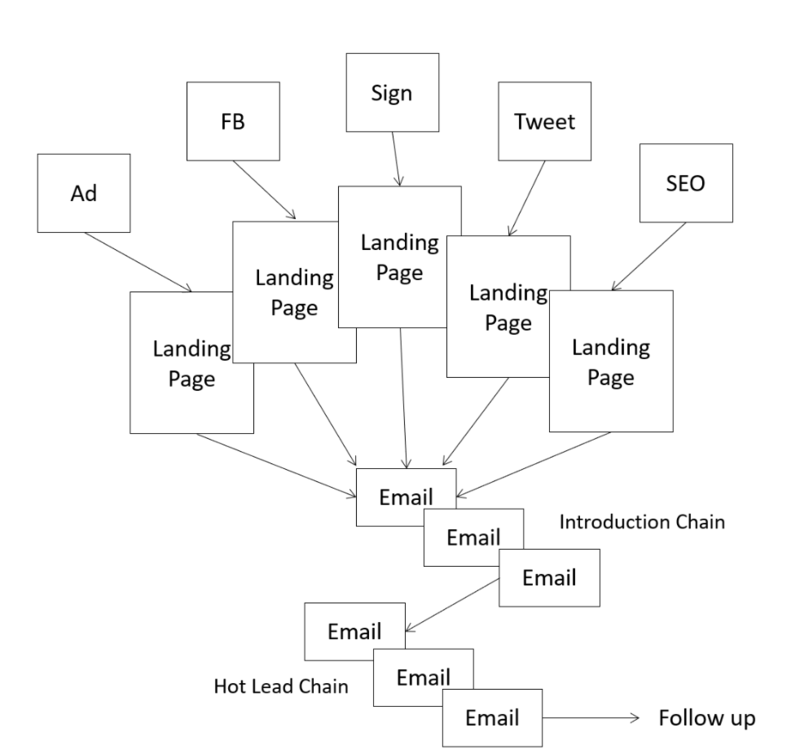 Once you have an email address, they fall into the email automation funnel until a sale or follow-up is required. Now that we have a view on what to do with your leads, we'll talk about how to actually get those leads.